Go where the pros can&apos;t with the APL Concept 3. 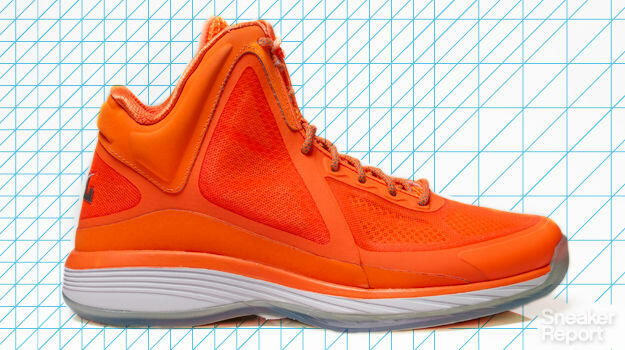 In 2010, the NBA banned the APL Concept 1 for allowing an "undue competitive advantage." Through the use of its patented spring-based Load &apos;N Launch technology, the APL Concept 1 promised to increase the wearer&apos;s vertical leap, and the subsequent NBA ban was the biggest endorsement possible for APL. Now, the lineage continues in the form of the APL Concept 3. It features the same controversial Load &apos;N Launch technology in the forefoot, but the design has been tweaked for improved performance. At 14.7 ounces, the APL Concept 3 isn&apos;t the lightest shoe on the market, but it makes up for the extra weight with its innovative tech and an especially well designed upper. It&apos;s constructed with yet another APL innovaton, FloZone, which is a mesh and synthetic based upper designed to provide the highest level of breathability possible while maintaining the support and lockdown required on the court. A snug fit is guaranteed thanks to an internal bootie, and the ankle collar is heavily padded for comfort and extra lockdown. The midsole is composed of a traditional foam and a rigid TPU shank for an ideal balance of response and stability. Down low, a segmented herringbone pattern is combined with an orbital groove design to ensure safe transitions and quick stops on the hardwood. Of course, the real kicker here is the Load &apos;N Launch tech. Implanted into the forefoot area, this "launch pad" compresses upon impact, or the "Load" phase, and then releases with an explosive burst in the "Launch" takeoff. Although results will vary from player to player, APL touts up to a three inch increase in vertical leaping. Best for: Bigger guards and small forwards looking for a way to add some extra height to their vertical or just try out a solid, well-ventilated model.